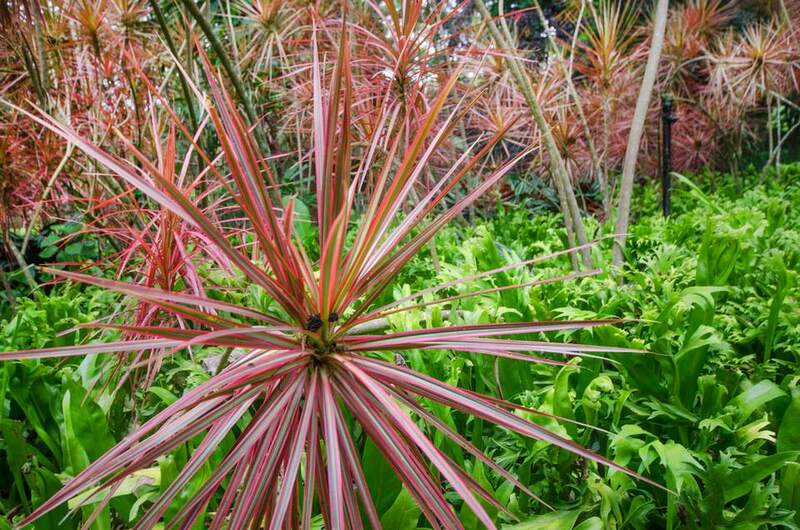 Dracaena marginata is an attractive, stiff-leaved plant with colorful foliage that sometimes goes by the name "dragon tree." Most of the time it’s sold simply as “Dracaena marginata” or just “Dracaena.” These plants are perfect for a beginner gardener because they're very easy to grow indoors. They are tough, drought-tolerant plants with aggressive root systems that make excellent houseplants because they are a little more forgiving than some of the other dracaena. It helps that they’re attractive and varied. Sometimes they are grown as single-stemmed plants; other times grouped or even braided together in the same pot. Dracaena marginatas are mostly indoor plants that are easy to care for and can thrive in homes and offices. They are listed by NASA as an excellent plant for removing harmful chemicals from the air. The plant has narrow, slender gray stems that are topped with shiny, arching leaves that are sword-shaped. The leaves are deep green with reddish edges, making for a dramatic look. In the spring on the outdoor varieties, fragrant tiny white flowers bloom and are followed by circular yellow-orange berries. On indoor plants, flowers and berries rarely appear. Dragon trees grow best in medium sunlight but they can survive in partial shade as well. Plants in lower light situations will grow slower and will produce smaller leaves. Don't put your dragon tree in full sun because its leaves will burn. For indoor potting soil, use loose, well-drained potting mix. Make sure their pot has room for the extensive root system. Some varieties are imported from Hawaii and will arrive with lava rock. If this is the case, remove about 1/3 of the soil and replace it with potting soil. It's easy to over water this plant. To ensure that you don't drown your houseplants wait until the topsoil is half dry before watering. In low light, this can take up to 3 weeks for the topsoil to become half dry. If the plant develops brown tips on the leaves, that is a sign of overwatering or water with too much salt or fluoride in it. Like other plants in its genus, Dracaena marginata is sensitive to fluoride, which can cause discoloration. To avoid fluoride that might be in your tap water, water them with distilled or non-fluoridated water if you know that your tap water has fluoride added to it. If there are a lot of yellow leaves, this likely means the plant needs more water. Dragon plants prefer temperatures between 70 to 80 degrees Fahrenheit. Regular household humidity should be fine for them. If your house is particularly dry, consider a light misting from a spray bottle. They have a lower need for fertilizer. It is best to fertilize lightly at the beginning of spring or twice a year with controlled-release fertilizer. Do not fertilize in the winter. Repot your dragon tree into larger pots as necessary. Since these trees grow so slowly, they might not need to be repotted more than every second or even every third year. Refresh potting soil annually with fresh soil to replace any that has compacted. Dracaena marginata roots easily from root tip cuttings, so easily that it’s often used in dish gardens and readily propagated by nurseries and retailers. It takes about three weeks for the cutting to sprout roots and using a rooting hormone isn’t necessary. Dragon tree cuttings can make a thoughtful housewarming gift and using cuttings from your own plant is a personalized touch. Beautiful as it is, the plant is also poisonous. While it's not harmful to humans, the leaves are extremely toxic to cats and dogs. If your pets like to nibble on your houseplants, avoid this plant in your home. Although they are usually disease resistant, Dracaena marginata are susceptible to scale, mealybugs, and thrips. Mealybugs are easy to identify as they leave small, sticky, cottony deposits. Dracaena marginata plants are also very susceptible to the common plant pest, spider mites. They tend to occur when temperatures are warm and the air is very dry; however, they are very difficult to see until they have already damaged the plant. What is the Best Way to Grow Dracaena Deremensis?